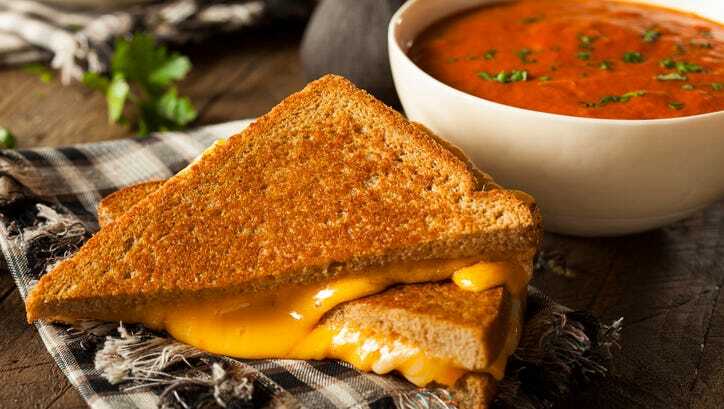 Grilled cheese sandwiches are a favorite comfort food for many. See below for 10 different variations from quick and simple to complex and challenging. The following sandwich-making tips come from food writer Laura Werlin's "Great Grilled Cheese," her third cookbook, which pays homage to this American classic with 50 creative sandwich recipes. 1. Grate, don't slice: Grated cheese melts faster, so the bread tends not to burn. 2. Soft is best: Always use softened butter -- it will spread easily on the bread and make the bread brown evenly. 3. Salted butter is best: Salted butter adds more flavor to the outside of the bread. 4. Nonstick is best: Always use a nonstick skillet so sandwiches won't stick to the pan. 5. Cover it: Best to cover the sandwich when cooking on the first side, in order to melt the cheese sufficiently. Log in below for a collection of great recipes. Available both on page and as a downloadable PDF file. Recipes are below. If you prefer to download the recipes as a pdf, click here. Butter one side of each slice of bread. Place 4 slices on your work surface, buttered side down. Place a slice of ham on each bread slice, folding it to fit if necessary. Top with 4 to 5 apple slices per sandwich, followed by the cheese. Heat a large nonstick skillet over medium-high heat for 2 minutes. Put the sandwiches in the skillet (in batches if necessary), cover, and cook for 2 minutes, or until the undersides are golden brown and the cheese has begun to melt. Uncover, and turn the sandwiches with a spatula, pressing firmly to flatten them slightly. Cook for 1 minute, or until the undersides are golden brown. Turn the sandwiches again, press with the spatula, and cook for 30 seconds, or until the cheese has melted completely. Serve immediately. Butter both slices of bread. With the butter side of the bread face down place the cheese, tomato, and bacon on, top with the other slice of bread with the butter on the outside. On medium heat, brown both sides. Butter both sides of the bread, put American slices next to bread, mac and cheese in the middle and grill in a cast-iron pan until golden brown and melty. Serve with bread and butter pickles. Melt 3 tablespoons butter in a skillet over medium heat. Add apples, sugar, cinnamon and cardamom; cook about seven minutes, stirring frequently until most of the apple juices are reduced and the fruit is coated with a syrup. Remove pan from heat. Set aside. Place four slices of the bread on a griddle. Top each with one slice of Wisconsin Havarti, 1/4 of the spiced apples, another slice of Havarti and top with remaining slices of bread. Butter sandwich tops. Turn over and butter again. Place griddle over medium heat. Brown on each side three to five minutes, until golden and Havarti begins to melt. Cool five minutes before serving. Spread the mustard on both slices of bread. Add cheese, apple and walnuts to one, and top with the other slice of bread. In a small saucepan over low heat, heat the olive oil, sage and pepper until warm to the touch. Turn off the heat and let it infuse while you assemble the sandwiches. Place the cheese, divided evenly, on two slices of bread. Take care to bring the cheese all the way to the edge of the crust. Top each with a second slice of bread and press flat. Lay a heavy or weighted cutting board on top of the sandwiches for 10 to 20 minutes. Use a pastry brush to spread the sage oil lightly on both sides of the sandwiches. Make sure you go all the way to the edges, and try to distribute the sage and pepper evenly over the bread. Heat a cast-iron pan or griddle over low heat. Sprinkle with a few drops of olive oil, then rub it over the whole cooking surface with a paper towel. Add the sandwiches and cook, weighted with another heavy pan or a steak weight, until golden, about 2 to 3 minutes per side. Keep the heat low so that you don't burn the sage or pepper. In a small bowl, mix together the feta, olives, capers, lemon peel and pepper to taste. Set aside. To assemble: Butter one side of each slice of bread. Place 4 slices on your work surface, buttered side down. Spread the feta mixture evenly over the 4 slices. Press the Gruyere into the feta mixture, and top each slice with 2 pepper halves and the spinach. Press again to compress the filling. Place the remaining 4 bread slices on top, buttered side up. Heat a large nonstick skillet over medium heat for 2 minutes. Put the sandwiches in the skillet (in batches if necessary), cover, and cook for 2 to 3 minutes, or until the undersides are golden brown and the cheese has begun to melt. Uncover, and turn the sandwiches with a spatula, pressing very firmly to flatten them slightly. Cook for 2 to 3 minutes, or until the undersides are golden brown and the spinach has wilted. Turn the sandwiches again, press with the spatula, and cook for 30 seconds, or until the Gruyere has melted completely. Serve immediately. Line a baking sheet with a silicone baking mat, or oil the sheet lightly, and heat in an oven at lower temperature. The larger the baking sheet, the thinner the cheeses slices will be. Add the cheese to the simmering water a handful at a time while whisking or blending with an immersion blender until the cheese is completely melted. Pour the melted cheese onto the warmed baking sheet. Tip the sheet back and forth to form a single layer of even thickness. Cover the cheese layer with plastic wrap, and place it in the refrigerator until set, about 2 hours. Slice the cheese into pieces sized to fit your bread slices. When ready to prepare the sandwich, heat a skillet over medium. Alternatively, heat a sandwich grill or panini press. Cut the baguette into 4 segments, each about 4 inches long, then slice each segment in half lengthwise. Lightly butter the crust of each slice, then assemble the sandwiches, using a bit of pesto, a slice of cheese, a bit of sun-dried tomatoes and 2 to 3 basil leaves per sandwich. Panfry until the crust is toasted and the cheese is melted, 2 to 3 minutes on a side. Toss grilled asparagus with vinaigrette and let stand covered and refrigerated, at least two hours before using. Reserve. Lay six slices of bread on a clean, flat surface. Top each slice with (in order) two slices Wisconsin Fontina, three marinated drained asparagus spears, two slices Wisconsin Fresh Mozzarella, six fresh basil leaves, 2 1/2 tablespoons red pepper and two slices Wisconsin Provolone. Top with second slice of bread and brush both sides of sandwich with olive oil. Heat a large nonstick skillet over medium heat and grill sandwiches on both sides until golden brown. Transfer to baking sheet and keep warm in 350 oven eight to 10 minutes or until heated through. Peel and core apple; cut into thin slices and place in small saucepan. Add sugar, cinnamon and lemon juice; bring to boil, stirring constantly. When apples start to become transparent, remove from heat and set aside for about 10 minutes. In a wide medium bowl, whisk flour and milk until no clumps remain. Add sugar, vanilla and eggs; whisk until ingredient are fully incorporated. Set aside. Mix sugar, cinnamon and cocoa powder for coating; spread on large flat plate; set aside. Place mascarpone in a piping bag or resealable plastic bag. Snip 1 corner if using a bag. Set aside. Slice challah into 81/2-inch-thick slices. Heat butter in large skillet over medium-low heat. Dip bread slices, one by one, in batter on both sides. Place in skillet; cook until the first side is browned, flip to brown second side. Repeat with all slices, placing them on a flat surface, such as a baking sheet. Pipe mascarpone cheese in a 1/2-inch-thick layer over the entire surface on half the slices. Top with thin layer of reserved apple filling and 2 slices aged cheddar. Top with remaining bread slices to close sandwich. Return sandwiches to hot skillet; cook, flipping a couple times to melt the cheeses. Bread should be crispy, a good dark brown color. Remove from skillet; place directly into reserved cinnamon-sugar-coating mix on plate. Flip to coat both sides with the mixture. Halve sandwiches and serve immediately.